It’s mid-October. I know that in some parts of the country there is already snow on the ground, but here in East Texas we think that it is cooling down because it only gets into the high 70’s during the day. So now is the time that I am starting to cut wood for my stove this winter. I hold over a little wood from the previous year so that I will be sure to have some that is already seasoned. By the time I burn it, my newly cut wood will be dried out enough to make good firewood. When possible I like to cut wood that is already dead. That way I’m not cutting any live trees. My second choice is to cut trees that I need to get out of the way. This might be a tree that is in danger of blowing down on a power line, a tree that is shading my garden or orchard, or a tree that might fall and block road or driveway. Of course if these trees are not a good hardwood, I have to find another use for them or just let them lay. I prefer to cut oak or hickory. These split easily and burn hot. I sometimes cut an elm if it’s in the way but they are hard to split. Pine and sweetgum are very common on my farm but are not good firewood. In these times when everything is good, I use my chainsaw to cut wood; then I haul it up to the house where I cut it to stove wood length and split it. I still use wedges and a sledge hammer to split wood. I can’t see the financial advantage to a log splitter. It’s easier to split wood, but those things cost a fortune, they use fossil fuel, and I need the exercise anyway. If times were bad (i.e. 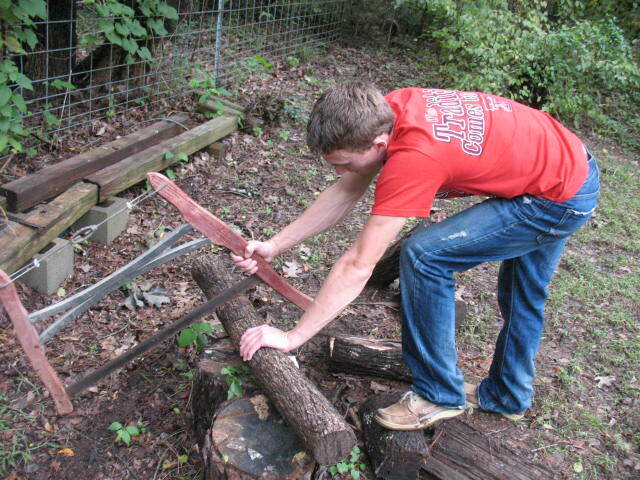 a total breakdown of the social order) I have my old stand-by, a crosscut saw. Actually I have three crosscut saws of different sizes. I wouldn’t want to make all the noise that a chainsaw does, and believe me; you can hear a chainsaw from a very long way off. A chainsaw would only attract attention that I don’t want, so the chainsaw is out during hard times. 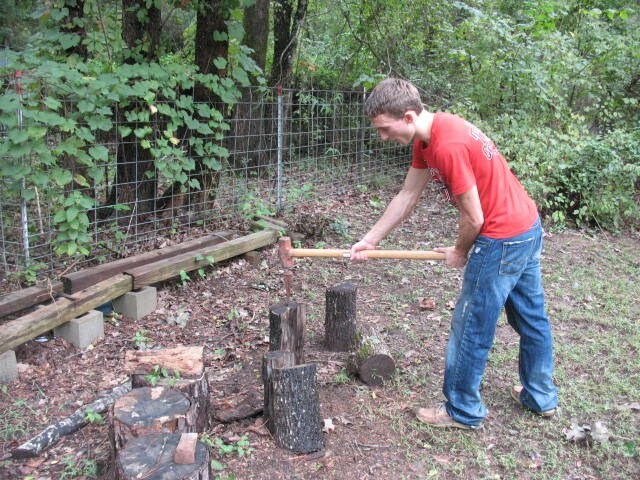 The basic tools that I use are a chainsaw, an axe, a sledge hammer, and some splitting wedges. 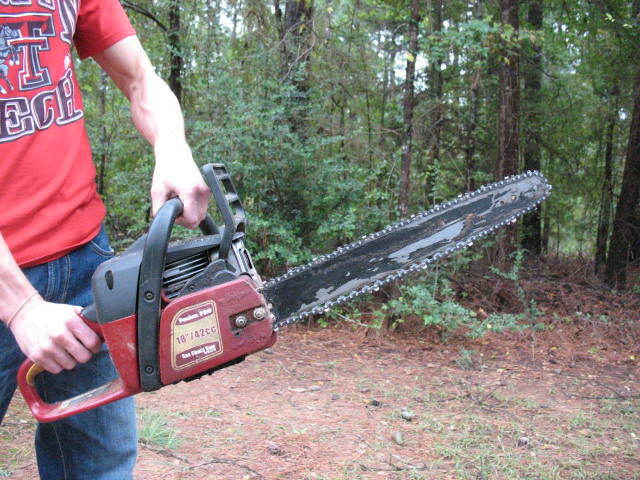 I use a Poulan Pro chainsaw with an 18 inch bill. Don’t wear yourself and your saw out by buying an undersized chainsaw. Also, learn how to work on the saw yourself. Sharpening a chain, cleaning the air filter, and replacing the sparkplug are easy to learn and will save you a ton of cash. Because of our mild winters, I only need about a cord to a cord and a half of wood to make it through the winter with my wood stove. The difference between burning wood and using my electric central heat is dramatic. When I don’t burn wood my electric bill is over $300 a month. When I use my wood stove religiously, it reduces my electric bill to about $100 a month in the winter. Quiet a difference. I keep my firewood up off the ground but I don’t cover it. I do keep about 4 or 5 days worth of wood on my covered porch so that I have dry wood. As I burn the wood on the porch, I bring new wood up from the woodpile. I have a kindling box built into the garden shed outside of my back porch where I keep a lot of split pine kindling. Getting a fire started in the stove is usually no problem, but if the wood is too wet and it is hard to get a fire going I use a little rich pine for kindling. This stuff will burn under any circumstances. I have even soaked it in water and then set it on fire with a single match. It is so heavy with pine rosin that it is almost like having wood that has been soaked in kerosene. Remember, a wood stove is not a good choice if everything has gone bad. That wood smoke might attract attention that you don’t want, so keep the kerosene heater ready for use at first, and wait a while on the wood stove if possible. Still, with that said, there’s nothing that says home to me more than driving up and smelling the hardwood smoke coming out of my stove pipe. It just makes me fell at peace with the world.